On September 7, 2015 in Port Moresby, the Federated States of Micronesia and the Independent State of Papua New Guinea signed the Amendment to their Maritime Boundaries Treaty. The amendment improves the treaty with new coordinates and maps in the original treaty signed back in July 1991 in Palikir, Pohnpei. H.E. 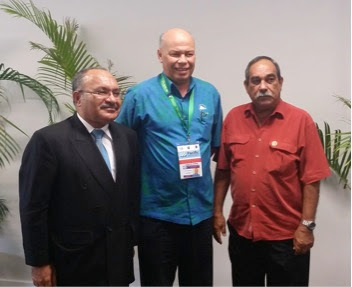 Peter M. Christian, President of the Federated States of Micronesia and the Prime Minister of PNG, the Right Honorable Peter O’Neil signed the amendment on the occasion of the 46th Pacific Island Forum held in Port Moresby, Papua New Guinea. With the advancements of technology and mapping systems, FSM and PNG have been working together in the last few years to improve the coordinates used through a series of technical and legal meetings supported by the SPC-Geoscience Division and the Attorney Generals’ Department of Australia and Forum Fisheries Agency. President Christian thanked those agencies for their legal, technical and financial support, which has culminated in the signing of the Amendment to the original treaty. He expressed with appreciation that the two countries can now go to sleep and wake up not asking if someone has moved the boundaries. Speaking before the signing, Prime Minister O’Neil stated that “This will enhance some of the work that we are going to do in fisheries and other maritime activities between our two countries”. Both Leaders stressed the improvement that this amendment will make on fisheries management and enforcement of their waters rich in tuna resources. 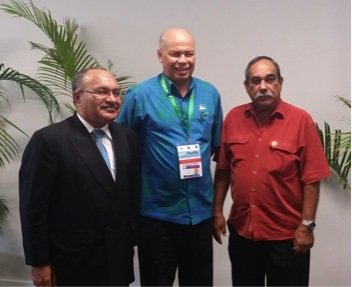 President Christian also thanked PNG for their continued leadership in other collaborative work with FSM. These on-going efforts include: the Joint submission on the Ong Tong Java Plateau continental shelf, FSM’s Euripik Rise and Mussau Ridge submission’s. President Christian concluded his remarks by stating that the signing of the Amendment closes a 24 year “unfinished business” on the FSM-PNG maritime boundaries and it is time to move on to other important cooperative arrangements that the two countries can mutually benefit from.